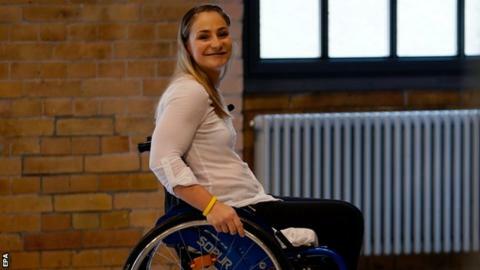 World and Olympic champion Kristina Vogel, who was paralysed in a training crash in June, has said she wants to "give something back" to cycling. The 27-year-old German, an 11-time world champion, suffered serious spinal and chest injuries in an accident at the Cottbus Sport Centre Velodrome. "I realised quickly I would not walk again," said Vogel on Wednesday. "Tears will not help. It is what it is. I am ready to take on this challenge and make the best of it." In a news conference at the Berlin hospital where she has been treated, Vogel described the moments following the crash. "I said 'breathe, breathe, breathe' and then I checked," she said. "Then I saw where I lay, how I was. When my shoes were off I knew that this was it with the walking. "Asking 'why me' does not bring you any further. I want to get back into life, not depend on a lot of help. I must use this strength I had in competitions for my life. Vogel had previously suffered serious injuries when she was hit by a minibus in 2009 while riding near her home, being placed in a medically-induced coma. However, she battled back to win Olympic gold in the track cycling team sprint at the London Olympics in 2012 and then an individual sprint gold in Rio four years later, despite her saddle breaking at 60kph in the closing metres of the final. Vogel, who also worked as a part-time police officer, said the accident happened when she collided with a Dutch rider, who she did not name. "I have had no contact with the rider. Neither the Dutch federation nor the rider have been in contact," added Vogel.